This floral tapestry "Amphora Bouquet" shows a gorgeous rose arrangement in a garden amphora. This scene is idyllic as we see a glorious garden urn in white, beautifully ornate, carrying an abundance of flowers and roses. 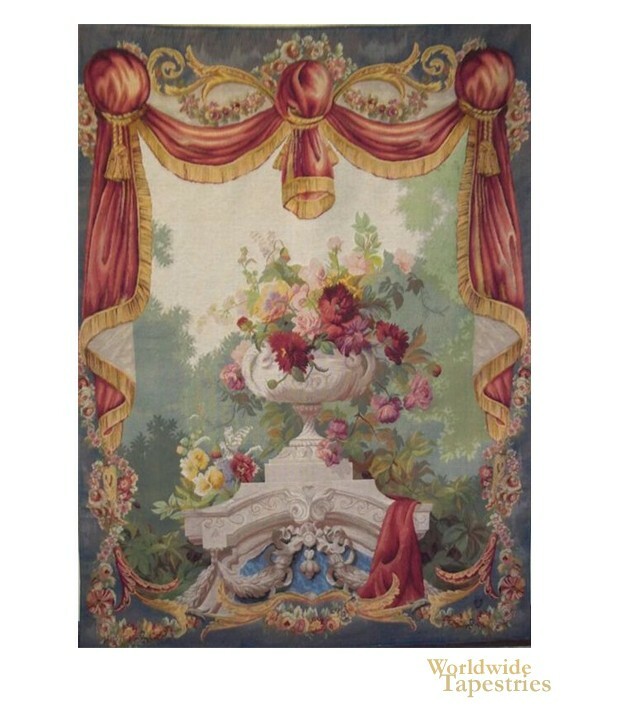 In this Drape Fleuri tapestry, there is a red drape on the urn pedestal, and reflects the large red drape in the border of the work, to decorate the scene in a theatrical way. This beautiful piece shows the French love of flowers still art, and combining flowers with nature, to produce works of considerable charm. This floral tapestry "Amphora Bouquet" is backed with a lining and has a rod pocket for easy hanging. Dimensions: W 56" x H 77"